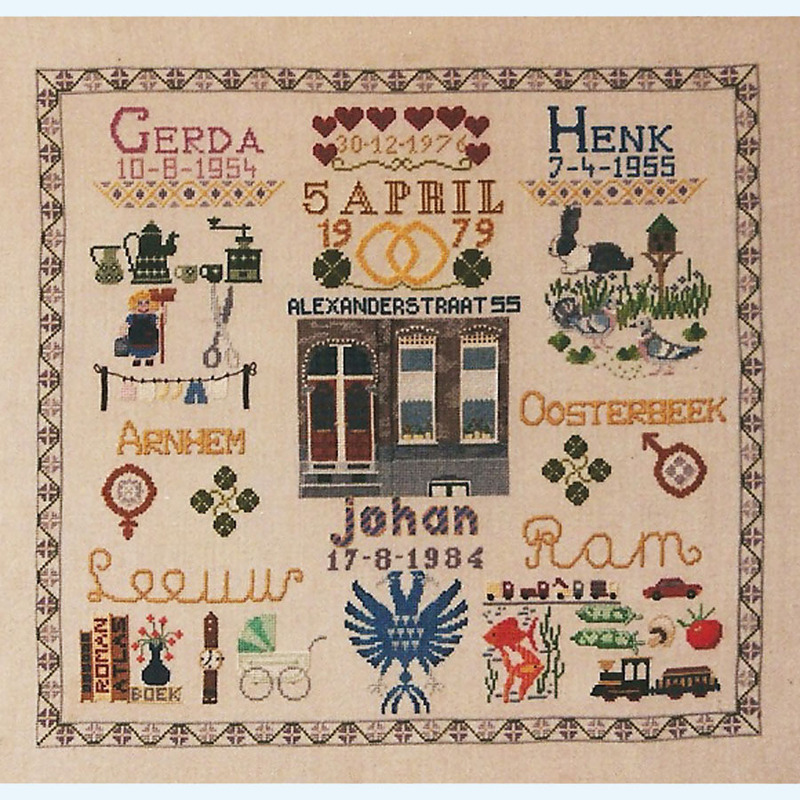 In this gallery you can find pictures of embroidery that I made but that are not my own designs. 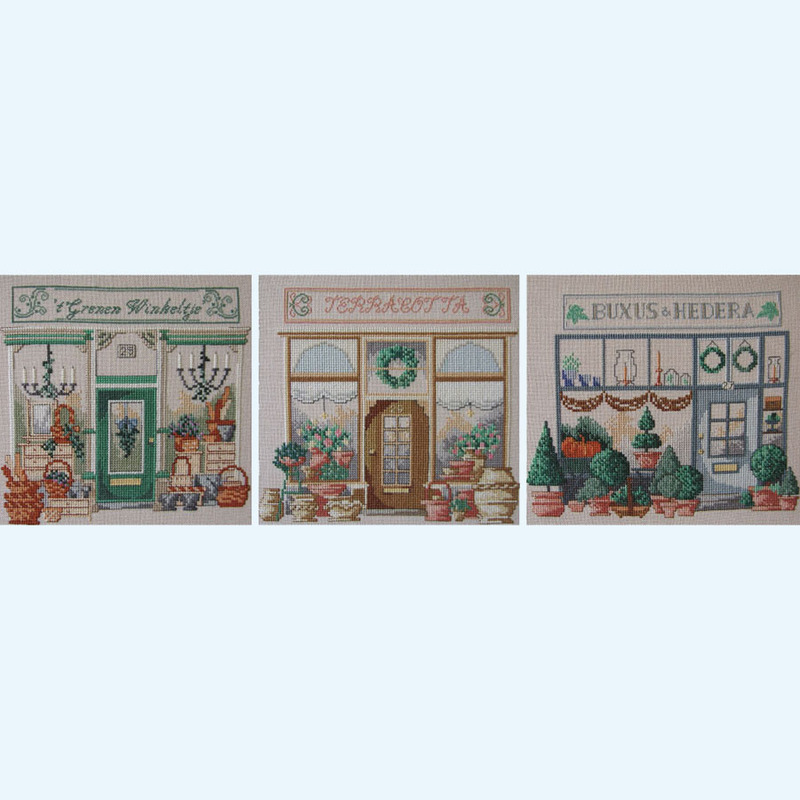 I made a lot of embroideries over the years and many of them have gotten lost. Would you like to share your own work here? If you send me a picture with your name, location and some background information on the work I will put it online. Case This is my first embroidery work! I’m eight years old, third year primary school. I used the case that was made from this work for very many year and I’m so glad that I still have it. Never again I would be so proud finishing an embroidery work. This work was the start of all the embroidery projects that followed. Bookmarks 1 After the case a whole series of bookmarks followed as gifts to several people. 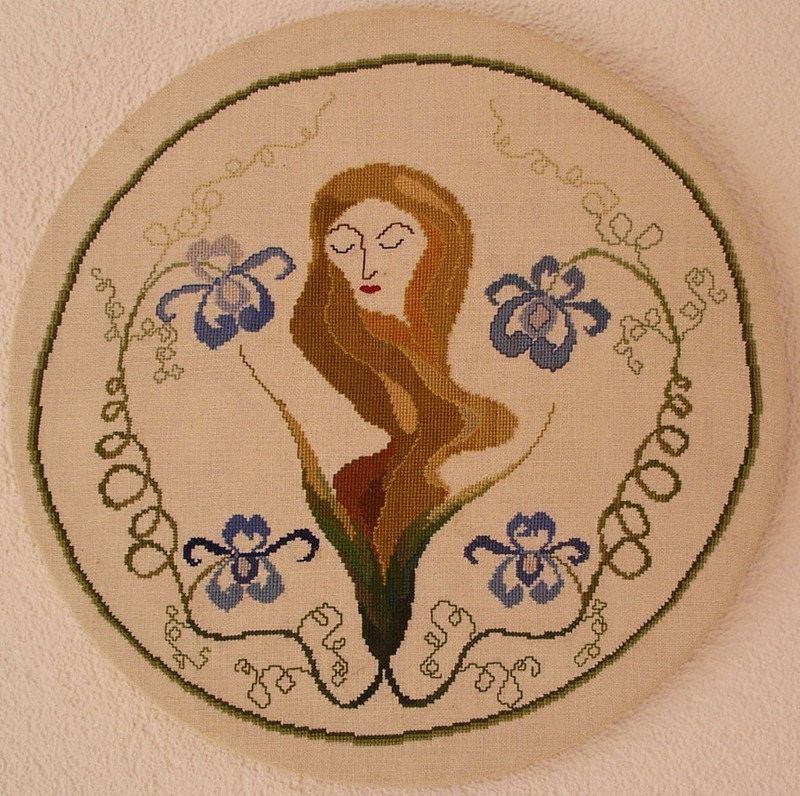 Flowers Lady This my first own designed larger embroidering work. The pattern got lost. Book cover My first embroidery work with another kind of stitches of own design. Wild Flowers My first finished pattern of Eva Rosenstand from Denmark. Samplers 1 There was a period I did embroidered lots of samplers. As a gift to different people on several occasions They were always a combination of existing patterns and own designs. In that way the finished pattern always was very personal. Some of the pieces of own design can be found at the free patterns. Three little shops I did also embroider these three little shops as a gift for my aunt Nolda. I don’t have the pattern anymore and don’t know the designer My aunt was very happy whit this gift. Lotus pond This pattern is designed by Carolyn Meacham and published by Serendipity Designs. This was a pattern in three parts, Cherry blossoms, Camellias and Lotus pond. I changed little things and made it one pattern. 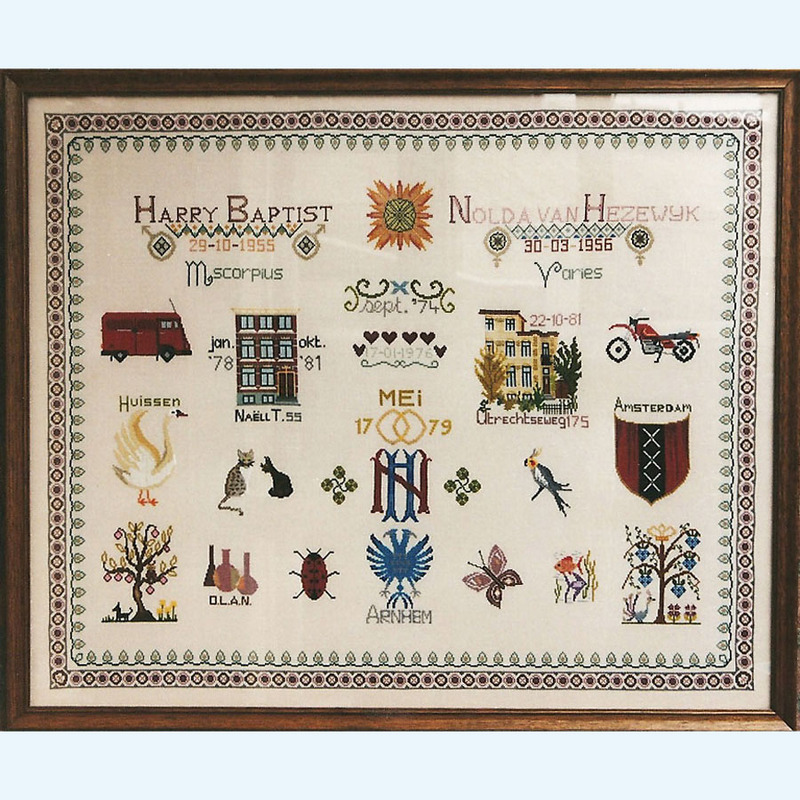 The embroidery was on the wall at my mother’s place for very many years. Sail Away This series sailing boats are designed by Jeanette Crews. On our holidays we boat around whit our little motorboat, but my husband is an experienced sailor. It was great fun to embroider these brightly colored sails. Dragons The upper Dragon is a pattern of “Cross my heart” inc. “ “Dragon faire”. It contained more dragon patterns. I did embroider all of them. The bottom Dragon is of Dimensions and was a kit including charms. Chess Board This is a pattern designed by Carol Leather and published by X-Calibre Designs. The blocks in the original pattern are a lot smaller and there were chess pieces along the edge. I did embroider it in white, black and gold using light green fabric and gave it to a friend. Then I enlarged the blocks because we have a very large chess pieces. Now we can play chess on our tablecloth. Vitesse A friend of mine is a fan of the football club Vitesse of Arnhem in the Netherlands. For her I did design these patterns and embroidered the two smallest for her. I don’t know if she embroidered the two largest by now. If you happen to be a fan of this club and would like to have the patterns, please send an email. B.O.A.T. project I made these patterns for the B.O.A.T. project. BOAT stands for ‘ Accompanied Supportive Labour process and wants to help people with a large distance to the job market in a challenging way to get knowledge, skills and work experience. Under the guidance of experienced professionals future BOAT-participants will repair and restore the old ship. 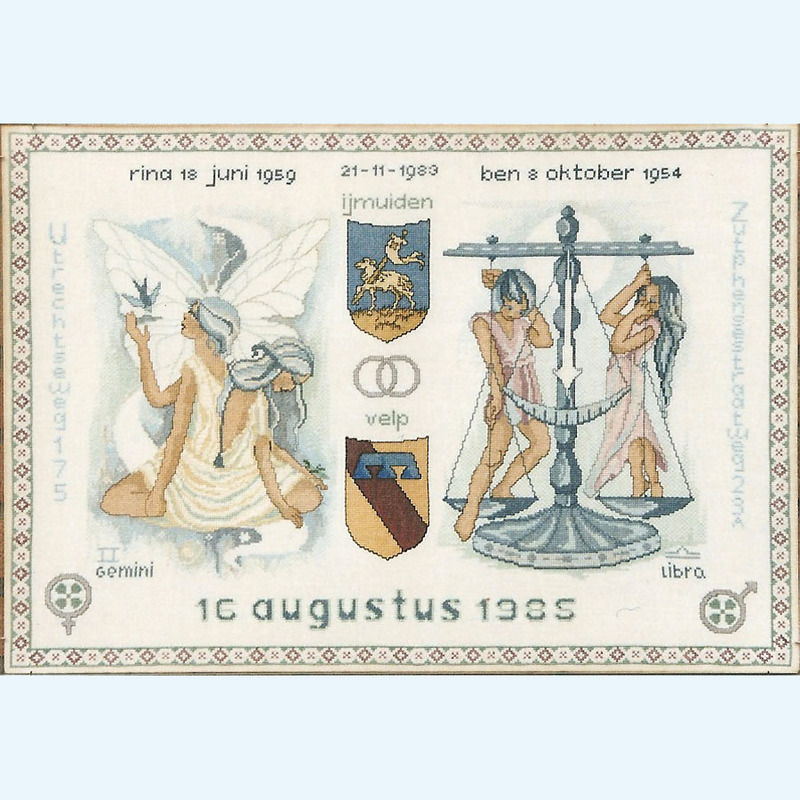 The RIBW works together with the SHSA (Foundation historical ships Arnhem) and several other Arnhem health and educational institutions. Alla Turca This pattern is designed by Pelin Tezer. It is a pattern in one colour. I did embroider the pattern with different kind of threads and different colours. Pelin lives in Turkey and is inspired by the culture and history of her country. 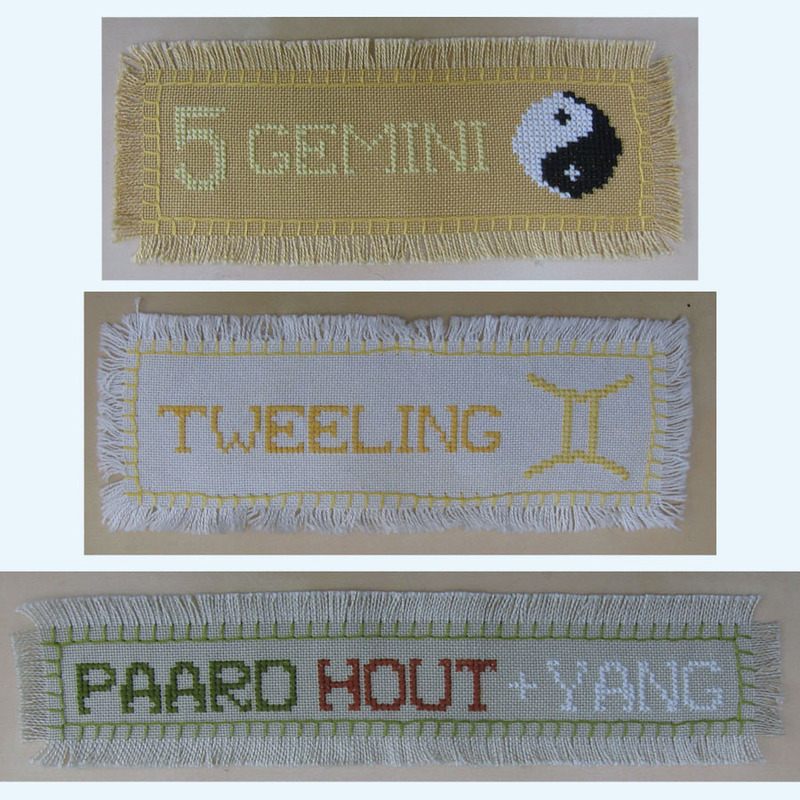 Bookmarks 2 Embroidering these bookmarks gave me the idea for pattern 162 Astrology East-West. That is a large collection of little patterns. Look at the description at pattern 62 Astrology East-West. Wolves Two patterns of wolves. 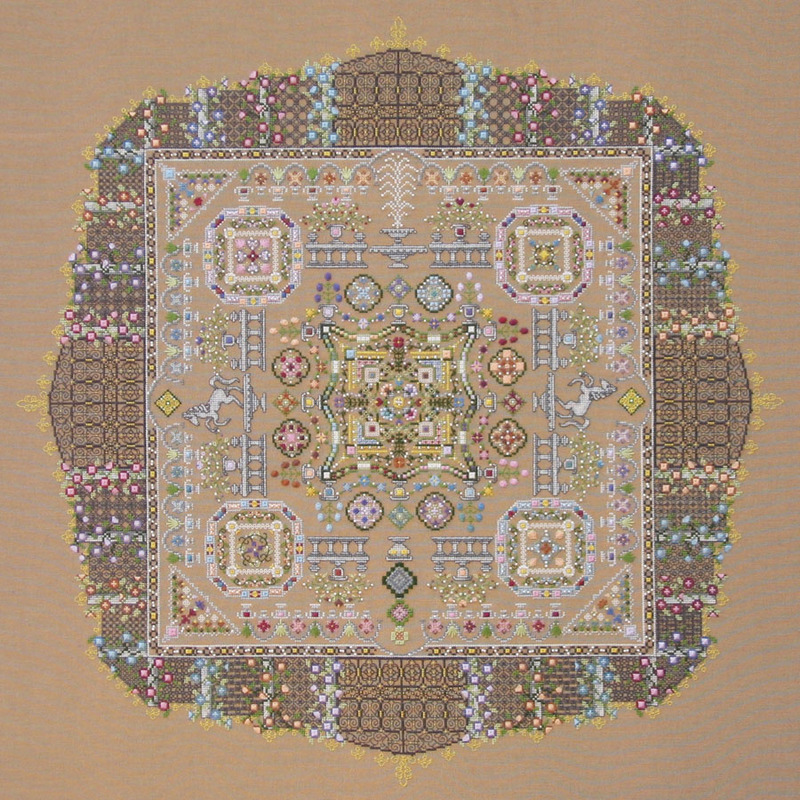 The top pattern is from “the gold collection” of Dimensions and is called The Guardian. In this pattern different amount of strands and combination colours of two numbers are used. The result is a pattern with lots of depth. I like the patterns from Dimensions very much. It is clear they put a lot of effort in designing the patterns The lower pattern is from “Cross my heart Inc.” and is called “Mates”. Finished this pattern is also very beautiful but during embroidering you will notice a lot of work making this pattern is done by the computer. Calatasaray I don’t care about football et all I made these pattern for a friend. She gave them to her husband as a present. They are of a Turkish football club. Chaos and power structure My son asked me to make and embroidering work of one of his paintings. 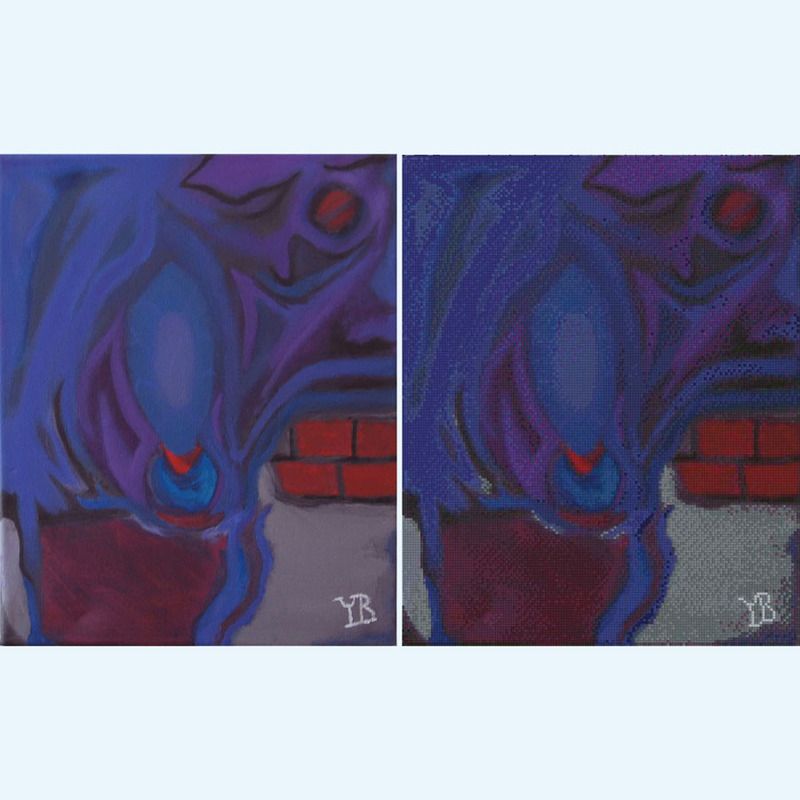 Left the painting and right the embroidery. Both of them are at the wall at his house . He is satisfied, therefore the project is succeeded. If you ever get such a request, don’t do it, it is a hell of a job. Amount of cross-stitches 27750 The pattern is not on the order list but on a special request I will gladly make an exception. Send me a mail. 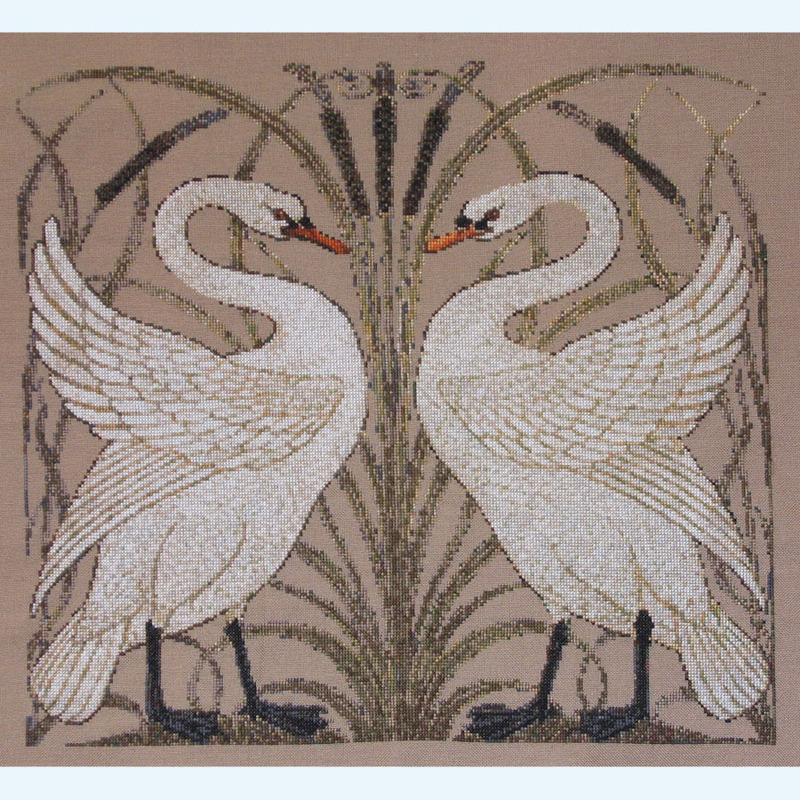 Swans This pattern is created by Tereena Clarke after a design by Walter Crane. 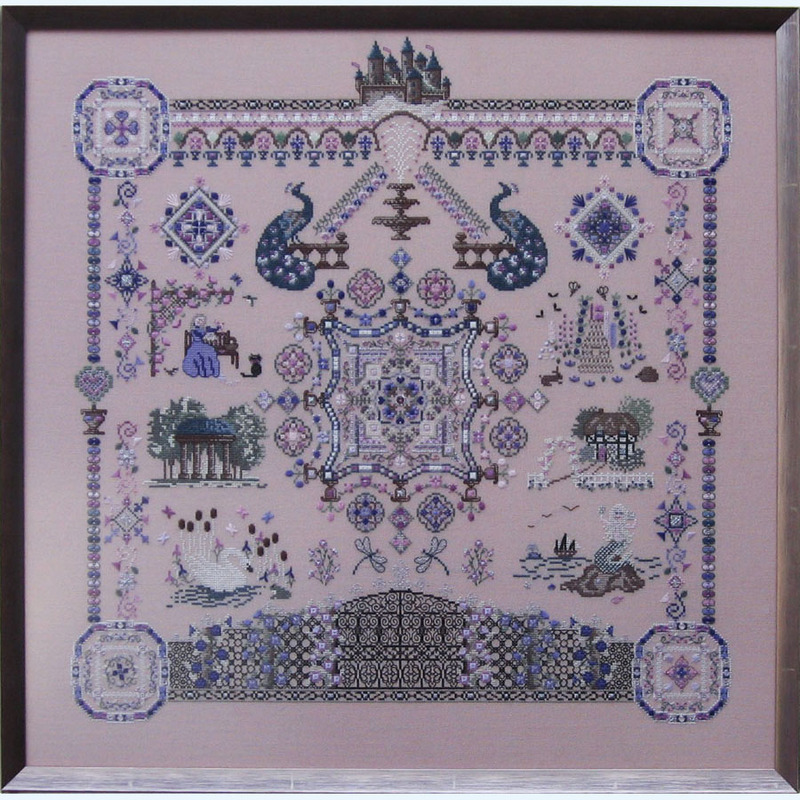 The patterns of Tereena only contain a digital photo never a finished embroidered example. The image is beautiful but I didn’t like embroidering the pattern. It is obvious that the pattern is made by a computer. I translated the DMC list that comes with the pattern to Au Ver à Soie-Soie d’Alger silk The background was filled in with a dark green colour, instead I used a brown fabric. Maybe in the future I will use this design by Walter Crane to make my own version of the Swans. Castles in the air This pattern is by Papillon (www.papillon – creations.com). It was a so-called “SAL” in 24 parts. It was a wonderful pattern to embroidery, with besides cross-stitches all kinds of specialty stitches that are well explained in the pattern. Part of the colours were yours to choose and given in DMC. I choose to translate all of the DMC colours to Au Ver à Soie-Soie d’Alger silk After this “SAL” Papillon has released a new one “Around the world in 80 stitches”, but I am still working on this one. Thanks Papillon for all your beautiful patterns! Castle Garden I bought this pattern at Papillon ( www.papillon –creations.com ). But I couldn’t resist to make some changes. In the original pattern the horse is up site down on the lower side. Now there are two horses, left and right. The black-work patterns were the same on all four sides. 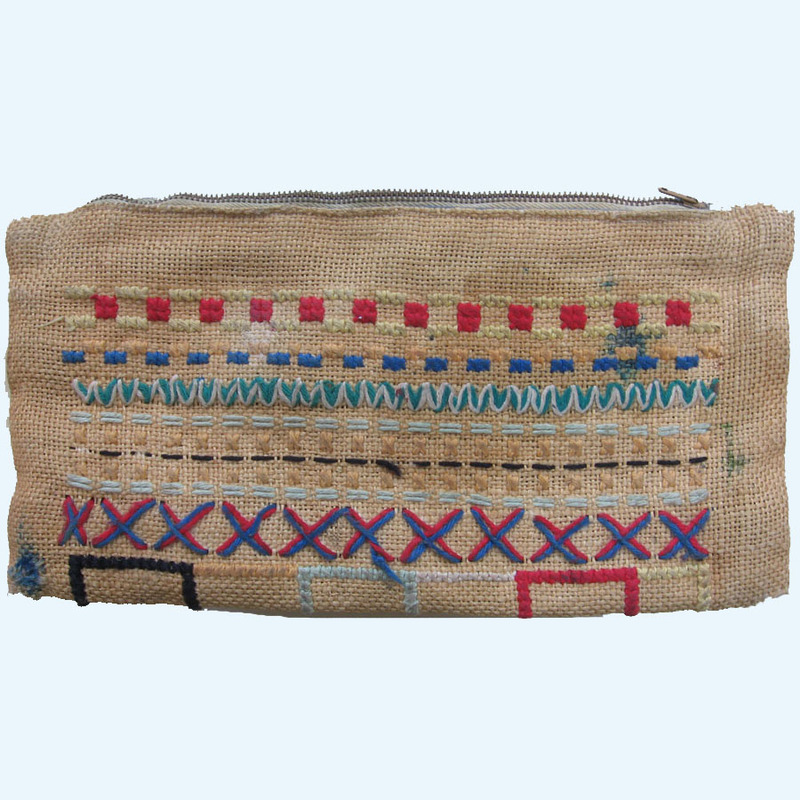 If you look closely you can see that in this embroidered version each of the four sides have different black-work patterns. I changed the DMC to Au Ver à Soie-Soie d’Alger and Waterlillies of the caron collection. I only used white beads instead of the two colours that were prescribed. Making these change it became an unique embroidering work. I really loved embroidering it. Milkman After 50 years of work, our fantastic milkman retired. He not only brought the dairy, he was the key figure of the social contacts in all his districts. We have had a very nice farewell party together with him, but all will miss him. I did embroider these coasters for him and his wife, so they have a pace to put their glass of milk. Christmas tree Beautiful Christmas tree. The pattern comes from an old embroidering magazine. I don’t remember which. Wounded it be a great idea if there was a worldwide library containing all the patterns to save them for now and the future embroidering generations.